Afghanistan could "implode" without more troops, and Iraq has become a "battleground" for al-Qaeda, warns an MPs' report on the war on terrorism. 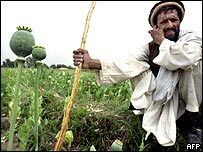 The Commons foreign affairs committee also says there is little sign of winning the fight against Afghan drugs. The MPs also say Iraqi forces are still a long way from being able to ensure security in their country. 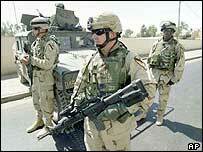 They say there are too few foreign troops in Iraq and that Muslim states should be encouraged to send forces. The wide-ranging report is the latest instalment of the MPs' long-running investigation into the war against terrorism. Russian support for Iran's nuclear activities "could risk contributing to the spread of weapons of mass destruction capabilities in the Middle East"
Tony Blair recently denied suggestions that Afghanistan had become a "forgotten" country amid complaints from some of the MPs on the committee who visited the country. The MPs back Afghan President Hamid Karzai's call for Nato's International Security Assistance Force (ISAF) to be given more resources. Conservative committee member Sir John Stanley told reporters that security in Afghanistan was "on a knife edge". Nato must answer President Karzai's call for more help, he said. "If we fail to do so then I believe there is a very serious risk that the country in security terms is going to go back very, very seriously. "We could end up with a situation that everything we have tried to achieve could be set back almost to square one." Nato's secretary-general seems to believe the alliance is dangerously close to failing the Afghan test, the MPs warn. And ministers need to spell out how they plan to reduce by 75% Afghan opium production by 2008, especially when the situation seems to be getting worse, at least in the short term. Committee chairman Donald Anderson said the problem was a clear example of how foreign policy could impact on British streets, where 90% of heroin came from Afghanistan. The Foreign Office says it is working on the problem but stresses there are long-term social and economic factors which would not change overnight. Wednesday's suicide bombing in Iraq, which killed 68 people, underlined the continued security problems in Iraq. The MPs blame the violence on a range of groups, including former members of Saddam Hussein's regime, local Islamists, criminal gangs and al-Qaeda. "Iraq has become a 'battle ground' for al-Qaeda, with appalling consequences for the Iraqi people. "However, we also conclude that the coalition's failure to bring law and order to parts of Iraq created a vacuum into which criminal elements and militias have stepped." Mr Anderson said the Iraq war might well have increased the terror threat in the short term, although it was too early to assess its long term impact. The Iraqi police and army remain a long way from being able to maintain security." The report says the failure of countries other than the US and UK to send significant numbers of troops to Iraq has brought "serious and regrettable consequences". Mr Anderson said involving more troops from Muslim countries would answer conspiracy theorists who believed the Iraq war was over oil. He highlighted Saudi Arabia's proposal for a new military force drawn exclusively from Muslim countries. "The fact is if there were not that support to help the Iraqi Government in terms of security, in the short term there is a real danger of Iraq becoming a failed stated that would be a danger not only to its own fragmented groups... but to the countries in the region," he said. The MPs praise the government for helping in the formation of Iraq security forces. But they continue: "We conclude that the Iraqi police and army remain a long way from being able to maintain security." The Foreign Office acknowledges people sympathetic with al-Qaeda are behind some of the Iraq violence but says it would be wrong to think the terror network would have withered away if there had been no war. "The report ranges across the whole of the so-called war against terrorism"